This is our Champion signature Inverter generator loaded with optional extras like Wireless Remote Start and Dual USB interface powered by a 3.1 kilowatt powerfull engine. Champion generators are in a league of there own with regards engine technology and features, all champion engines are designed, engineered and tested in the most demanding environments and can be proved by watching the testing videos on the CPE website. The main outstanding feature on a champion inverter is the delay stop allowing equipment to stop running or power down so no power surge applies and the second outstanding feature is the start up current it has a special peak current of 15.8amp for millisecond that is ideal for RV, motor homes and caravans allowing equipment to start up without tripping or overloading the generator especially running A/C units or similar. They also have a smart charge option that will charge the battery directly from the mains limiting power loss to the battery. 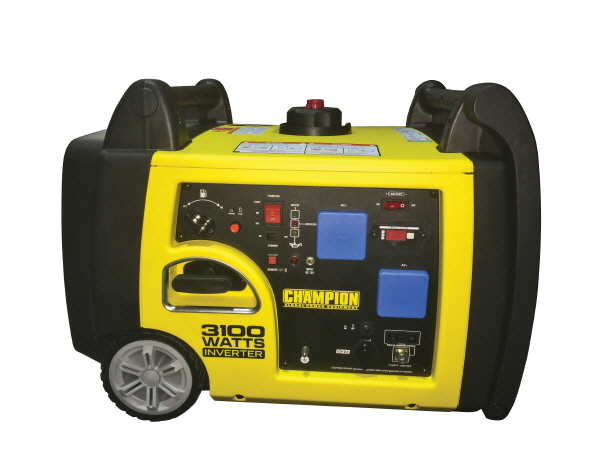 The Champion Power Equipment 73001I-P portable inverter petrol generator is powered by a 171cc Champion single cylinder, 4-stroke OHV engine that produces 3100 max watts. With a 6 litre fuel tank this unit can run up to 8 hours at 25% load. Our OHV engine is equipped with a low oil shut-off sensor and designed for long life and easy maintenance. This unit also contains true sine wave inverter technology making it safe to power all of you sensitive electronic devices. This unit is ideal for camping trips, hunting, travelling, picnics, tailgating, and light jobs around the house. The built-in handle and wheel kit make it easily portable.